Steve Immel Photography: Is that All There Was? Is that All There Was? When I chanced upon the remains of the town of Rice in California's Mojave Desert it felt like the most desolate place on earth. What compelled Standard Oil to build a service station where there are no humans on the way to absolutely nowhere is baffling. The crumbling mid-century station which once was Rice seems to be evidence of that folly. Yet here, as in New Mexico and Arizona, the Santa Fe Railroad gave rise to dozens of sidings and tiny settlements built to support it. Some persist. Some, like Rice, do not. To get to this garden spot head east from Twenty Nine Palms on Highway 62 heading to Parker, Arizona. I do not recommend July. 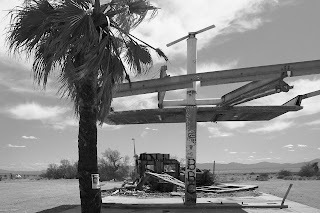 This photograph says so much, not the least of which is July in the Mojave. Unless the desert environment can be altered and made more hospitable, few humans stick around in a place like Rice.